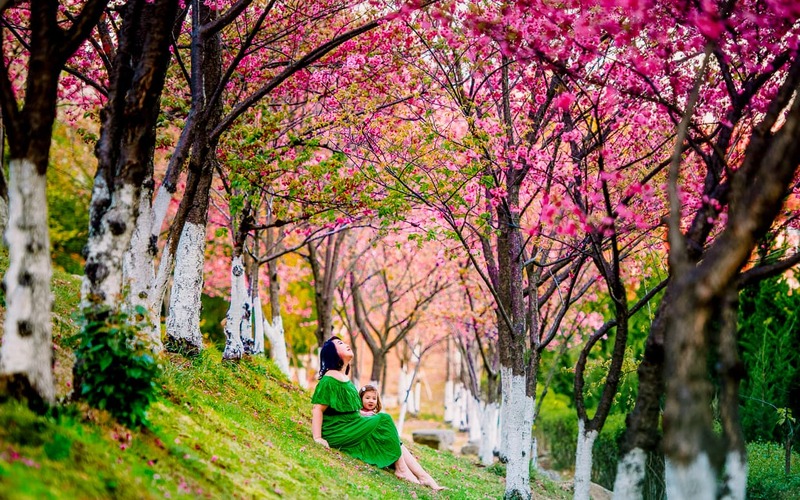 When we arrived in Dali, China, cherry blossom trees were just starting to bud on every street corner. 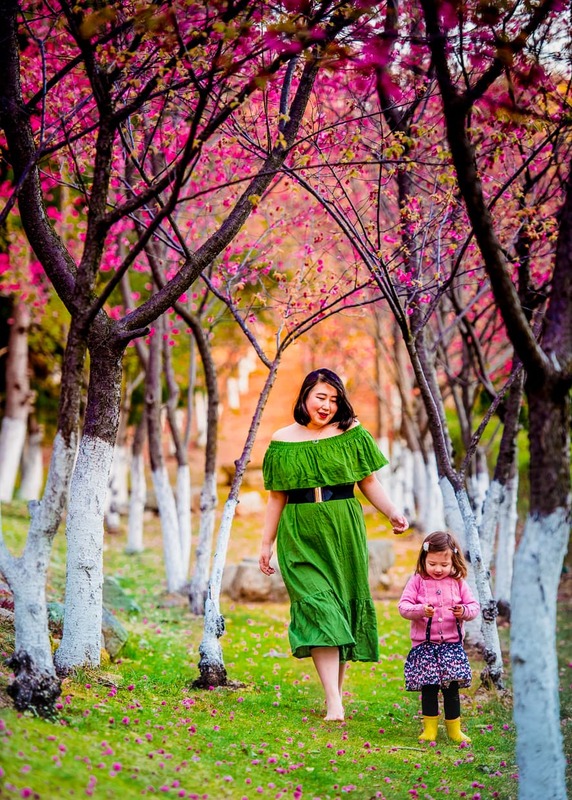 By about a week in, we had scouted out our surroundings, and made a list of the places we wanted to do our photoshoots once the flowers were in full bloom. 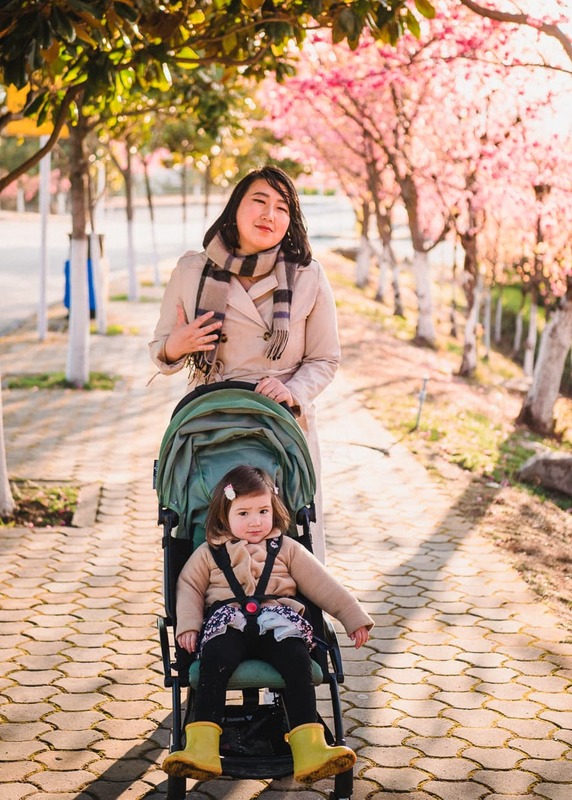 In addition to just walking around (which can be tiring for those of us who aren’t used to the altitude), we also consulted with the locals about where they’d seen the best cherry blossoms in years past. One location that kept coming up was the campus of Dali University. 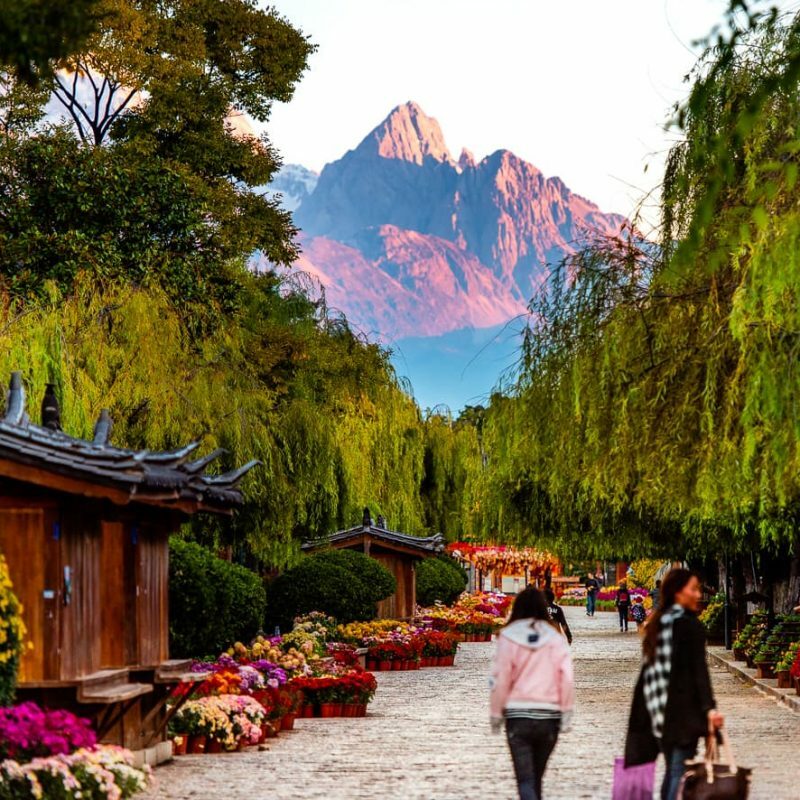 The front of Dali University in Yunnan, China. As it happened, Dali was less than a mile up hill from our Airbnb. Of course, at an altitude of over 6000 feet, thin oxygen and steep roads can make half a mile feel like the Appalachian Trail. Dannie and I went up to the University one afternoon to scout. 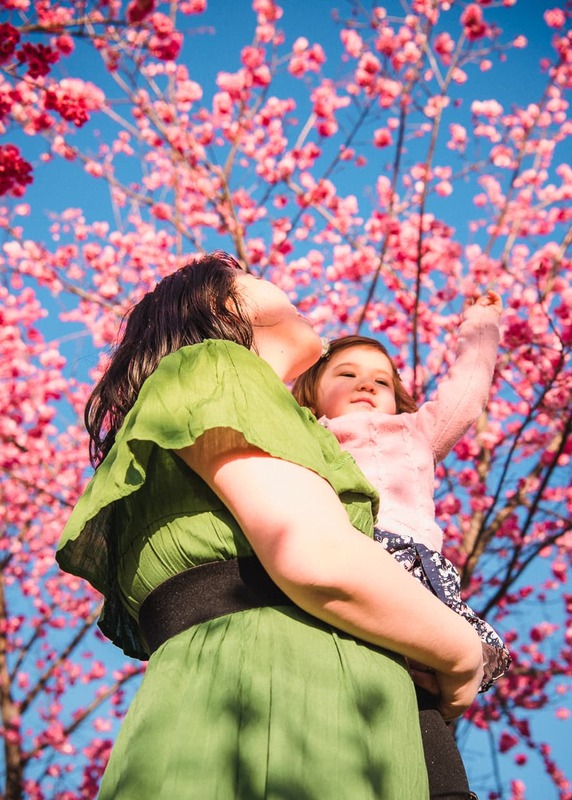 There were indeed many, many cherry blossom trees. 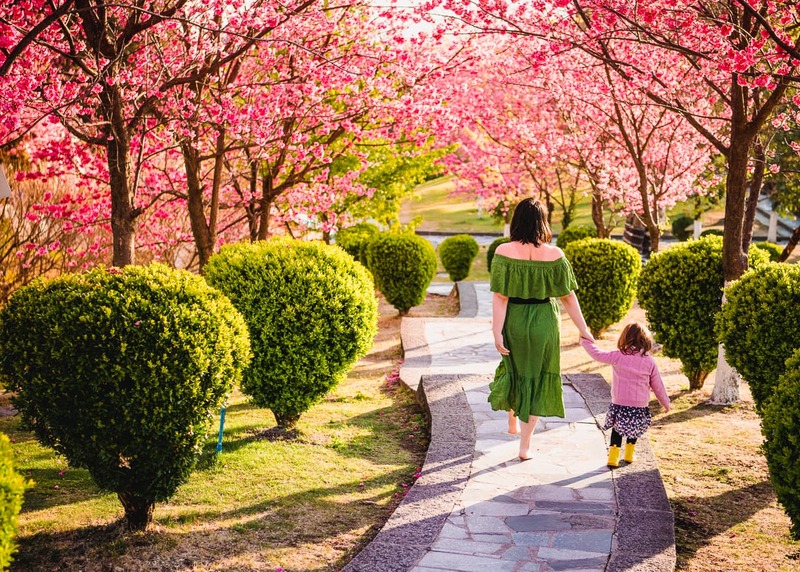 Wrapping around the lower level of the campus was a road, lined end to end with pink flowering trees. 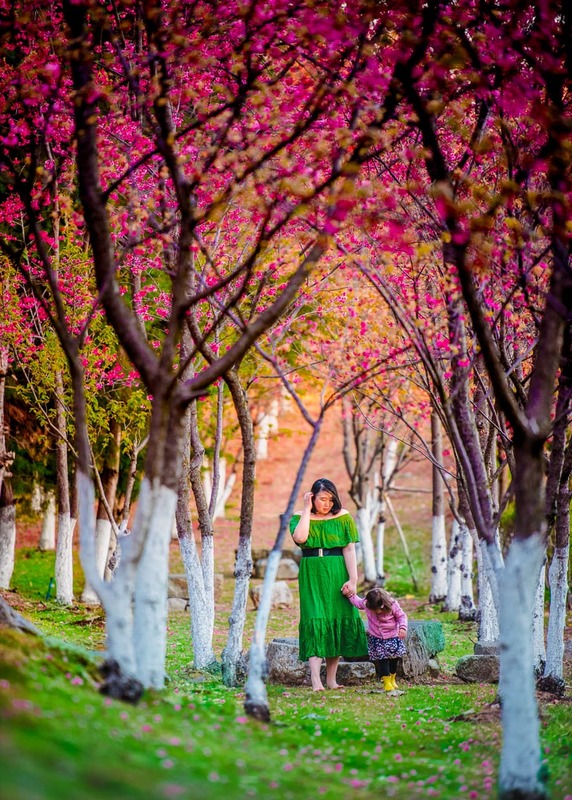 It wasn’t the natural looking, idyllic scenery that we were seeing elsewhere in town, but it was definitely a high density of blossoms. I had chosen a bad morning to do my scouting, though. It was orientation day at Dali University, and I had gotten a late start. The result was that the street was crowded and it wasn’t possible to get a shot without other people pointing their cell phones in the air. 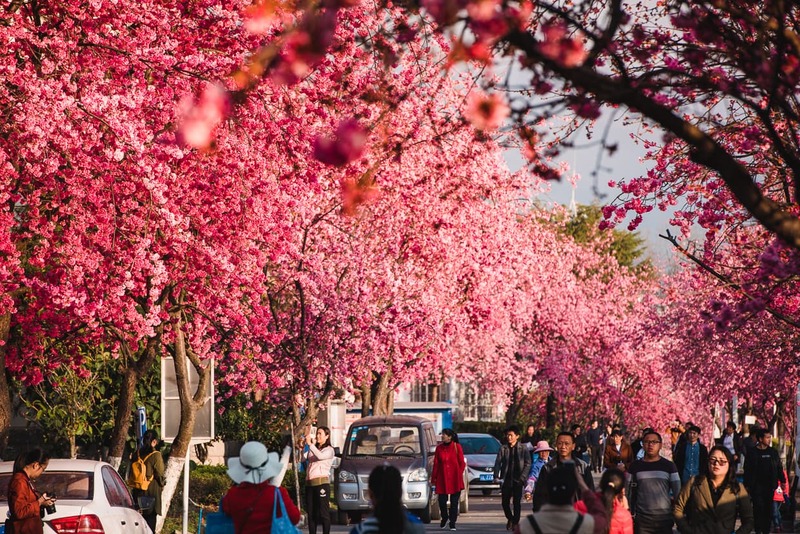 If you ever go to Dali University for the cherry blossoms, make sure you show up at the crack of dawn and finish up before classes start. 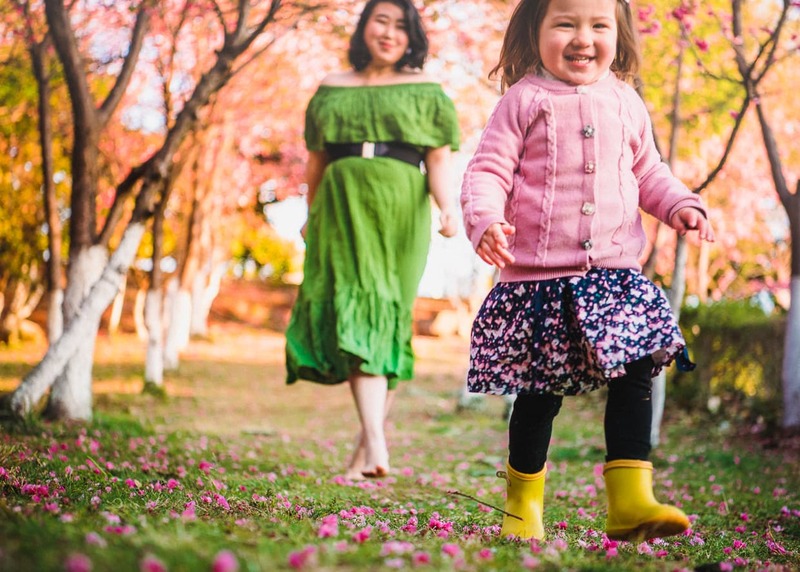 Because we had so many other beautiful locations to photograph and because I thought the environment at Dali University wasn’t as beautiful as other areas, I decided we probably wouldn’t make it back there for a family photo shoot. 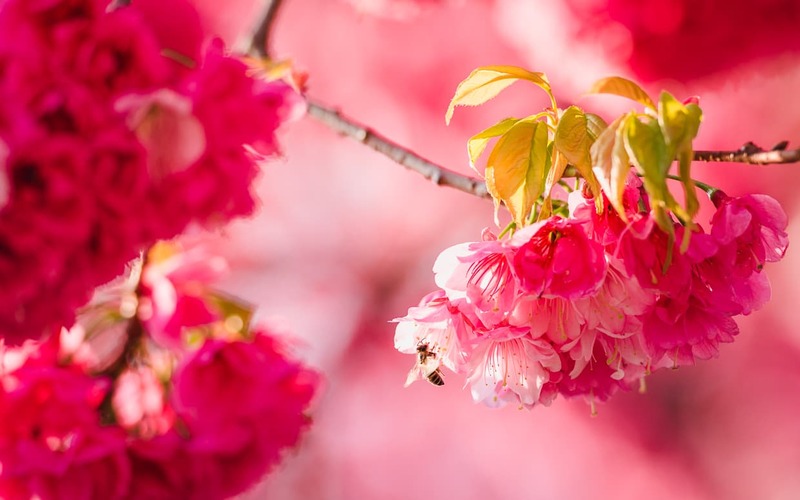 The cherry blossom trees in Dali, China were buzzing with bees. Then, a few days later, photos started popping up on WeChat (a Chinese social media platform) claiming to be taken at Dali University. They were much better than the photos I had taken, and looked like an entirely different setting. It seemed that my scouting trip hadn’t been as thorough as I thought. The next morning I got up earlier and made a return trip. When I returned to the campus, I held out my phone and showed the pictures to one of the few students who were passing by. I don’t speak Chinese, but they were able to direct me toward the crescent shaped building in the middle of the campus. 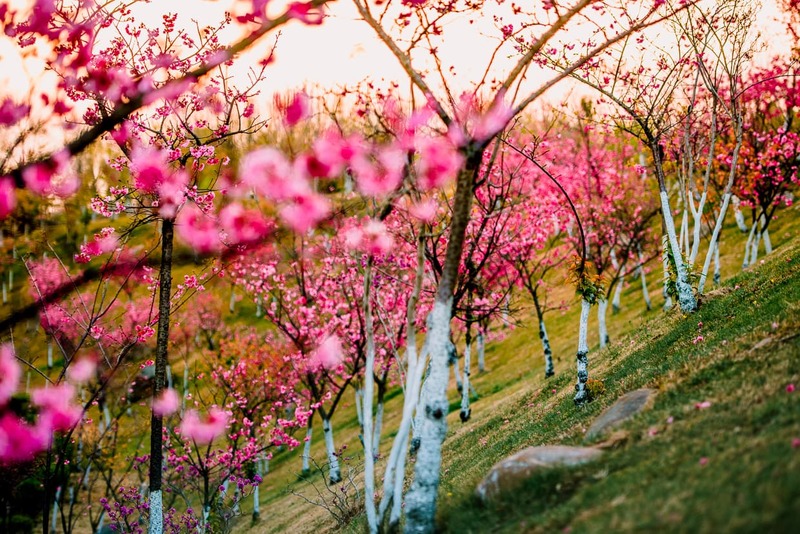 I was confused at first, but after walking through a tunnel in the center of the structure, I stepped out onto a curved hillside, ablaze with hundreds of cherry blossom trees planted in rows. I grabbed some quick photos – along with a few shots of the sun rising behind the iconic sculpture in front – but I knew I had to get Dannie and Lisa to come back for more. 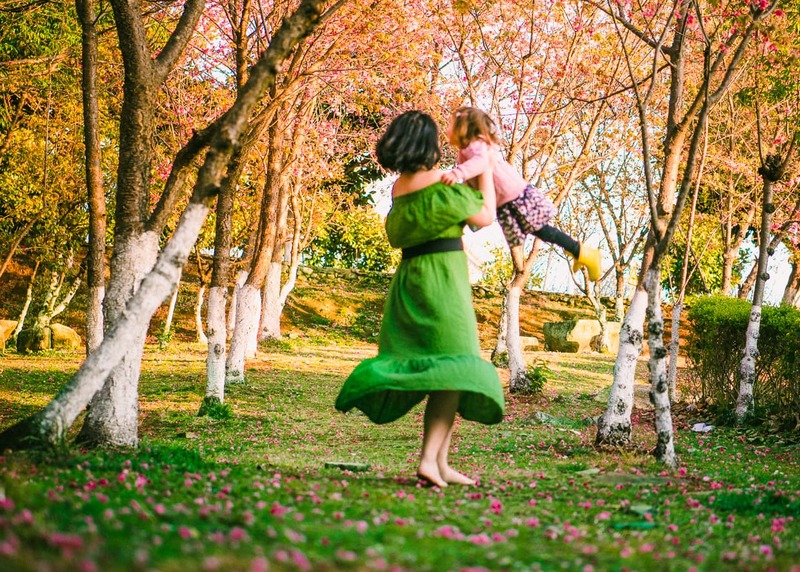 Our Family Cherry Blossom Photo Shoot at Dali University. 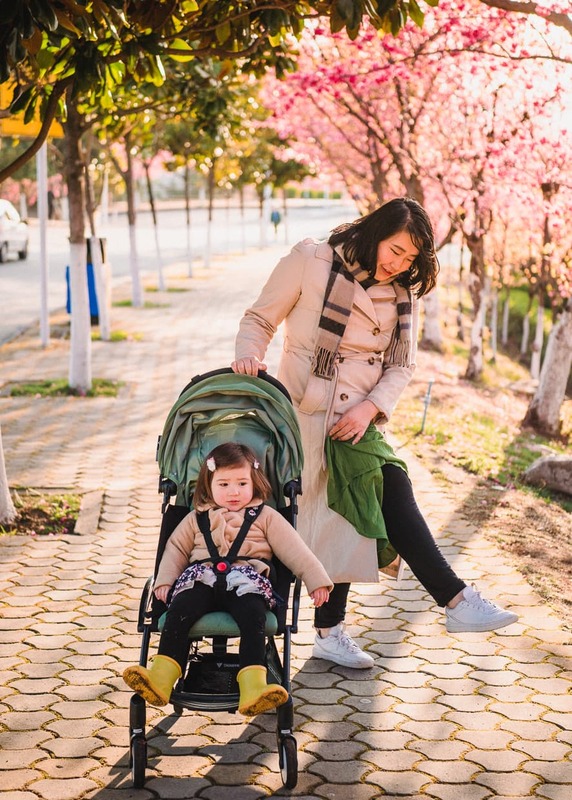 Luckily, cherry blossom season in Dali, China lasts for a few weeks in March, so we had the option of returning the next morning without losing the flowers. When Dannie and Lisa were with me, the hillside suddenly seemed a lot steeper and more menacing. Dannie was a little nervous on the slope, but she worked through it because she knew how good the photos would look. Lisa just thought it was fun to slide around on the wet grass. We walked along the hillside until we found a flatter space with some stone tables and benches. We even found a patch of grass where cherry blossom petals had started to cover the ground. These are the cherry blossoms I missed the first time I went to Dali University. Seriously. 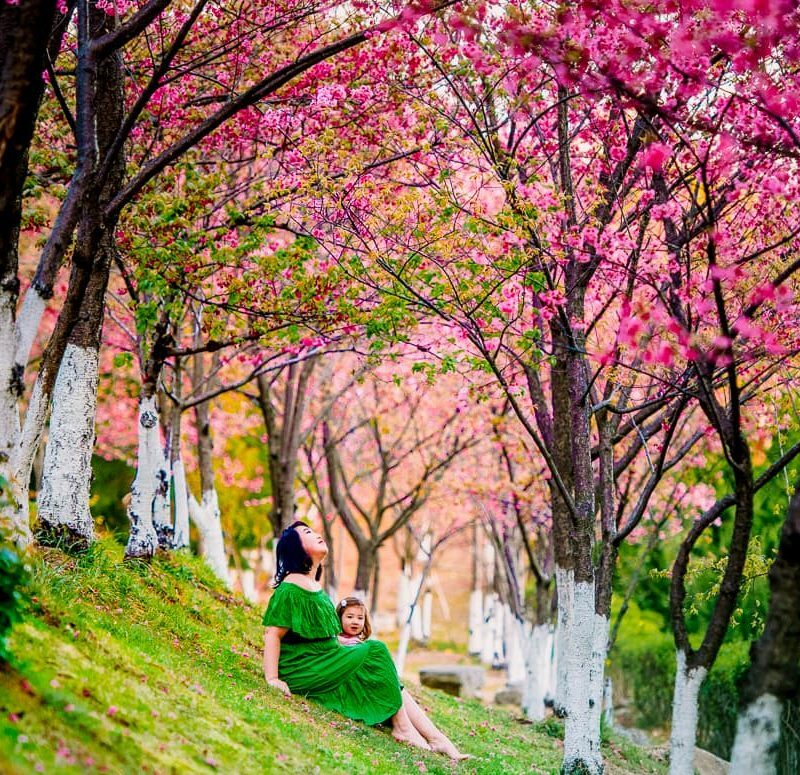 This is a good time to note that if you are photographing cherry blossoms in Dali, you should dress warmly. It’s cold in the morning, and Dannie and Lisa both wore jackets. When it was time to take the photos, we removed the jackets and Dannie pulled her leggings up. As soon as the photos were done – and when we were moving between locations – they both put their layers back on. 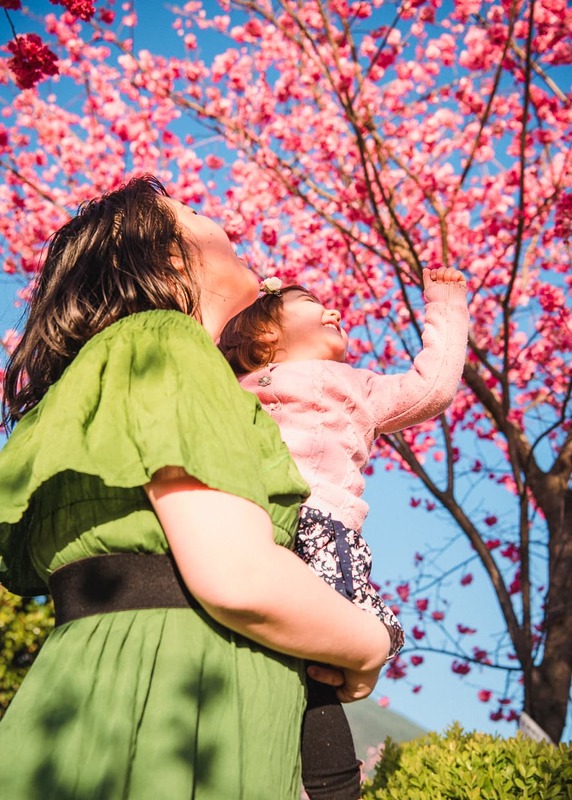 Under the cherry blossoms, we found a stone bench. 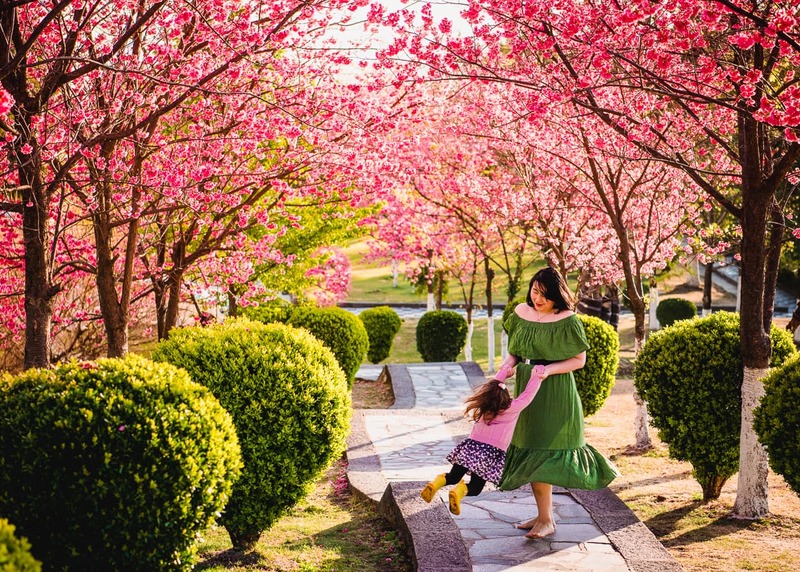 If you are planning on photographing cherry blossoms at Dali University, here is some helpful information. Here is Dali University on Google Maps. 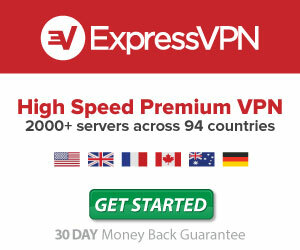 Unfortunately, Google Maps doesn’t work in China unless you are using a VPN (Read our review of ExpressVPN). Like I said, it’s chilly up there in the mountains, so dress appropriately. There are guards and gates by the Dali University entrance, but they never hassled us, just walk right in and take your photos. It couldn’t hurt to be discrete though. I’m not sure what the university’s position is on photography. They seem to allow it (how would they stop the thousands of people on campus from taking photos in the age of cell phones), but making a big production on private or government owned land is usually asking for trouble. Show up early! Anywhere in the world, sunrise is less crowded than sunset. Look around. 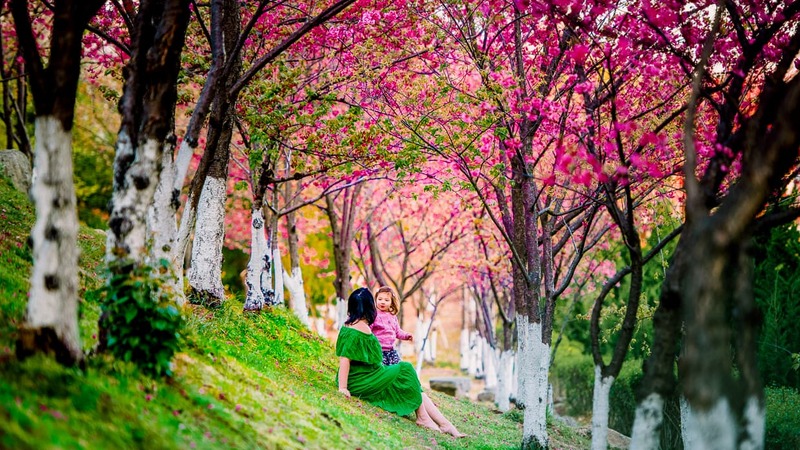 There’s a lot more to the scenery at Dali University than just cherry blossoms. The architecture is amazing, there are spectacular mountains in the background. In front of the University, the sun rises over Lake Erhai, casting light on gardens and reflecting pools. 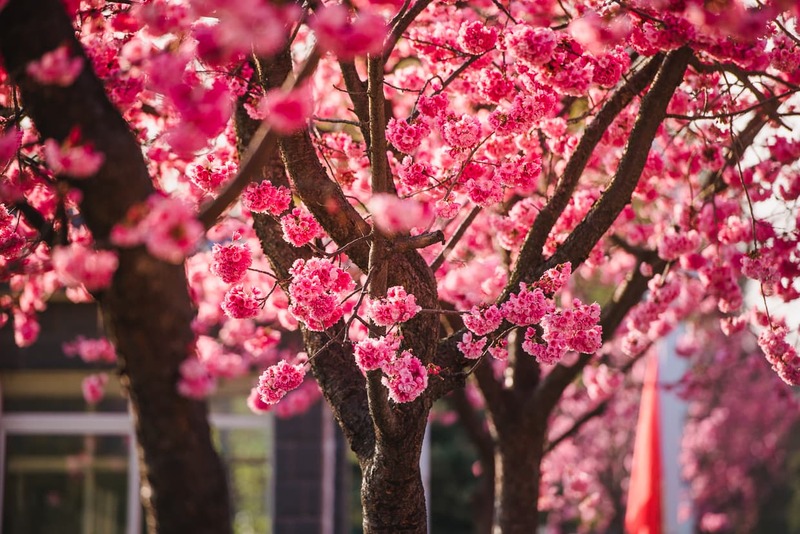 It varies a little from year to year, but it seems that the cherry blossom trees in Dali, China hit their peak in the middle of March. You’ll get better photos if you know how to use your camera and leaving nothing up to luck. 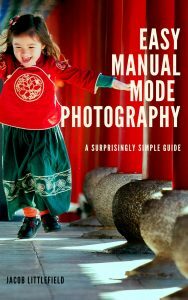 My e-book, Easy Manual Mode Photography, will help you do just that. 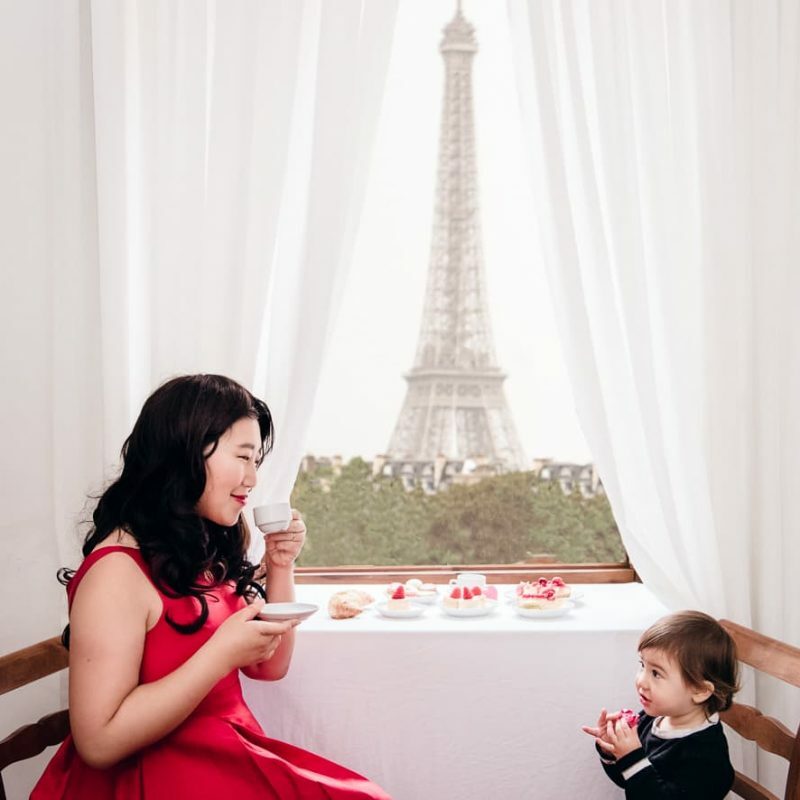 It costs less than a terrible cup of coffee in China, and it will help you take great photos for your whole life. 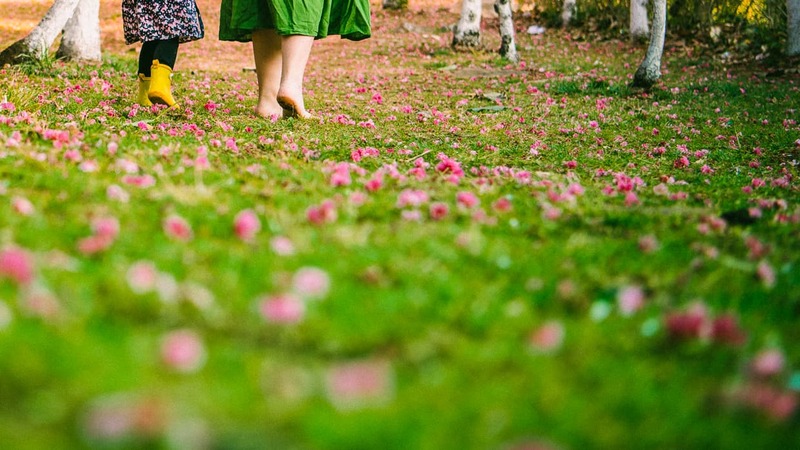 How we were dressed when we weren’t posing under the flowers. 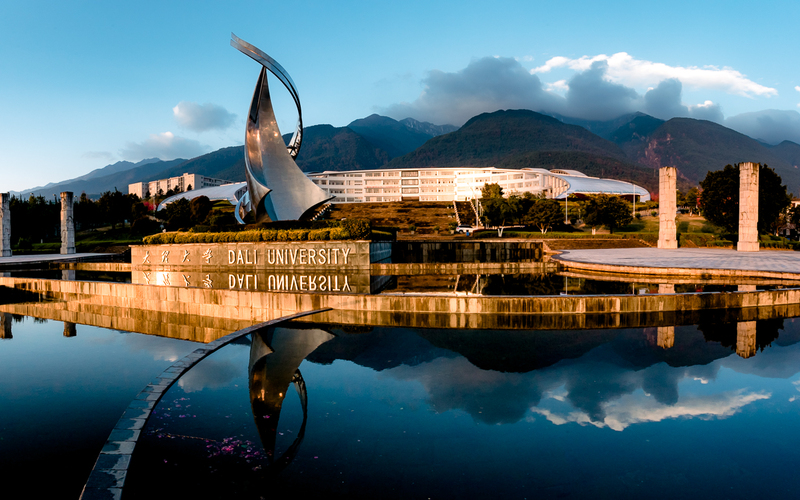 We were surprised and delighted that Dali was home to this scenic campus. 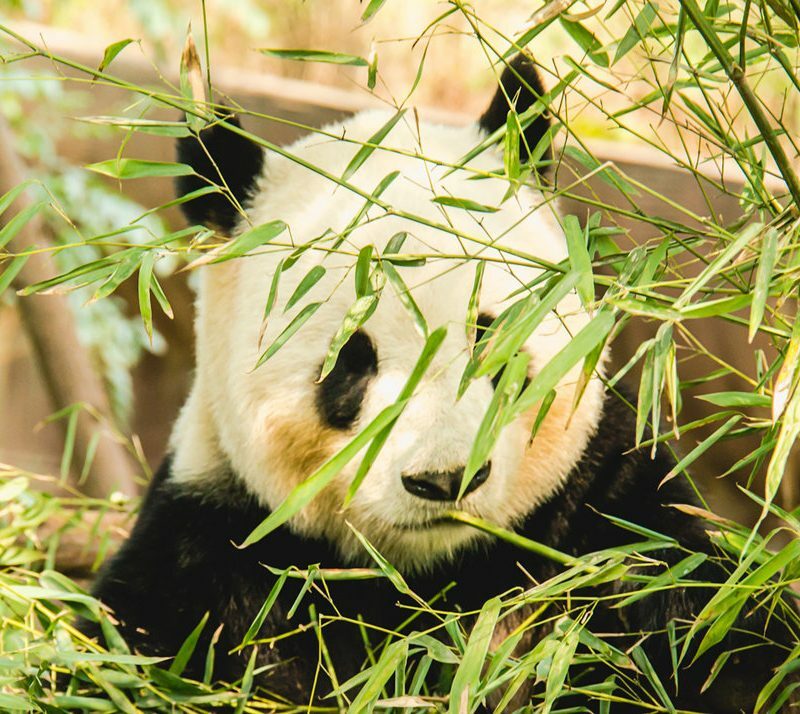 It wasn’t on our radar before we visited, so it felt like we had discovered a hidden treasure. We’ll probably be returning there for more photos, but in the meantime, we’re busy processing the images we took all over the region. 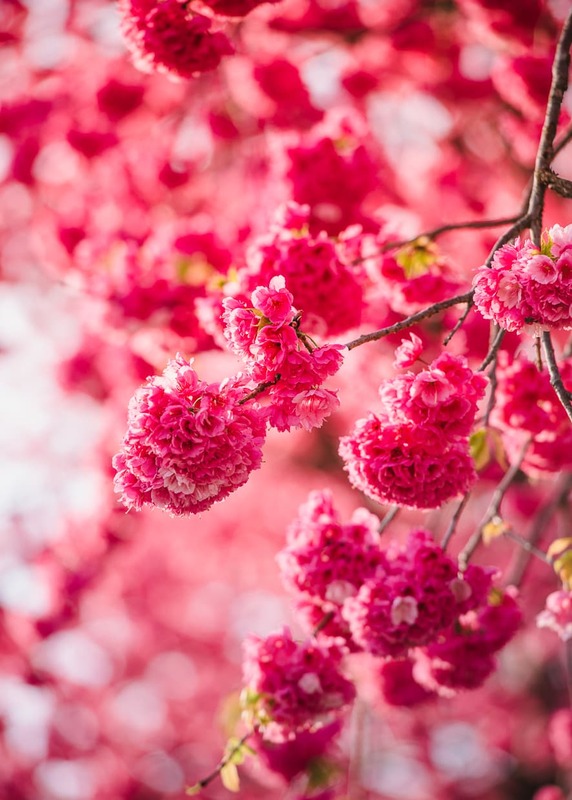 Don’t forget to check back soon for some more amazing pink cherry blossom landscapes. 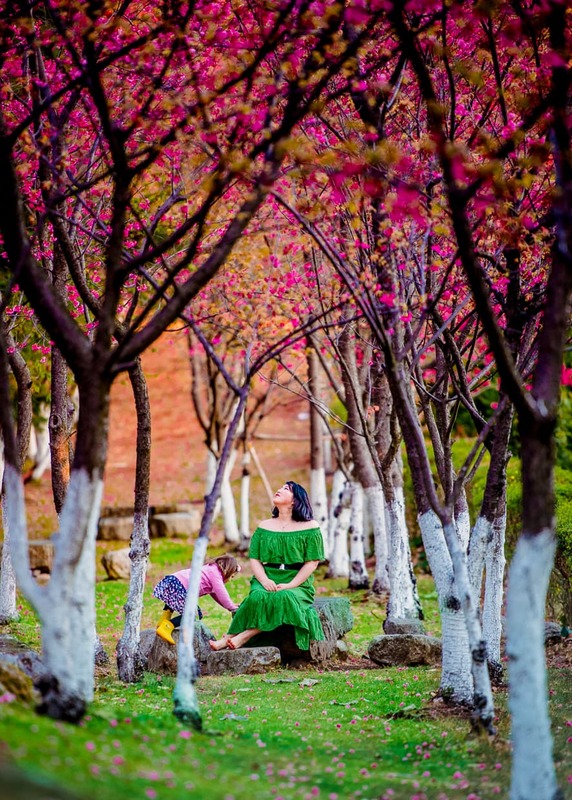 Update: For more incredible cherry blossom photos, you can now enjoy our new post – Photographing Dali China’s Cherry Blossom Valley. Great concept, great photos. Couldn’t see how to follow your blog, though. The website below is my WordPress blog – photos, travel, stories, memoir.